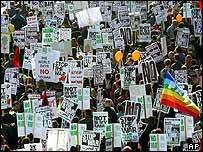 Protests against war with Iraq have been held in London and across the UK - the biggest rallies since the invasion began. The march through the capital, culminating in an afternoon of speeches in Hyde Park, attracted a crowd of about 200,000 people, according to a police estimate. The Stop the War Coalition said half a million had attended, still well down on the massive march on 15 February, with fellow organisers CND saying the total was between 200,000 to 300,000. But the day ended in confrontation with reports - denied by the Metropolitan Police - that riot police had charged a crowd of protesters who had blocked traffic in Oxford Street. Scotland Yard said officers had merely established a cordon to prevent protesters throwing objects at them. A spokeswoman said: "As demonstrators were making their way along Oxford Street our officers came under fire from bottles and other debris from some of the demonstrators." A total of 3,500 police officers lined the London march routes, and there were 10 arrests during the day. Further demonstrations were held in cities across the UK and at US military bases in Gloucestershire and Yorkshire, with other complaints about police tactics. The day was also marked by prayers for peace in churches and cathedrals around the country. Thousands also marched from Fairford Town in Gloucestershire to the local RAF base, where US B-52 bombers are based. The bombers are believed to have played a key role in Friday night's strikes on Iraq. About 1,000 police lined the route and watched as protesters laid wreaths "for the death of democracy". Three coach-loads of protesters from London were stopped and searched by police. Gloucestershire Police said items - the nature of which they did not divulge - were found which led them to believe that some of the protesters on-board planned to cause a disturbance. They were escorted back to London by police, with some of those on-board displaying signs protesting at the police's action under the Criminal Justice Act. A spokesman for CND condemned the move, telling BBC News Online: "The day went peacefully. Everyone wanted to go out and protest against the illegal and immoral war. "Then this happens to people. It is unheard of for 20 years." At the US surveillance centre in Menwith Hill in Yorkshire, police said they arrested about a dozen demonstrators after confrontations with officers on duty. The "Foil the Base" protest attracted about 1,000 people - hundreds arrived clad in tin foil or waving foil banners, which organisers hoped would disrupt communications by blocking satellite signals. The majority of the arrests followed angry confrontations between anti-war protesters and dozens of police in fields leading to the wire perimeter fences of the highly sensitive North Yorkshire base. In the prime minister's constituency in north-east England, about 100 protesters gathered outside Trimdon Labour Club in Sedgefield, Durham, to watch a caricature of Tony Blair jump through a hoop on the orders of a cartoon George W Bush. In Scotland, several thousand people took to the streets of Glasgow and Edinburgh to voice their opposition to war, with smaller protests in Aberdeen, Inverness and Dundee, where demonstrators targeted the Scottish Labour Party conference. Many of those in Glasgow complained they had been penned in by police in the city centre. Strathclyde Police said the demonstrators had been trying to stage a protest on the M8 motorway - and had been stopped from doing so for their own safety. In Bristol, a sit-down protest closed a road as 2,500 people gathered at a rally. Police made four arrests. About 1,500 anti-war protesters marched in Manchester. "Their protest now is about damage limitation"